Treat yourself to a deliciously refreshing American classic with A&amp;W Root Beer. 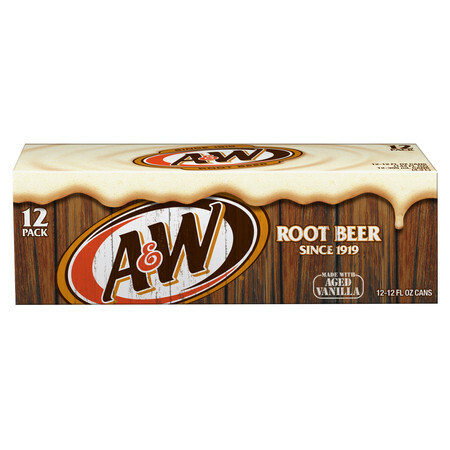 A&amp;W Root Beer is caffeine free, and has a sweet vanilla taste that has become the standard in root beer soft drinks. A&amp;W is best when enjoyed in an ice-cold mug or with vanilla ice cream for a delicious root beer float. Make your day a little bit sweeter with the rich and flavorful taste of A&amp;W Root Beer. Enjoyed by many at our company. Bought for daughter's wedding reception. Her request was for rootbeer--a favorite! Great deal, great price. This is one of my favorite drinks. The only drawback is the calories.